Included with your purchase of hearing aids, along with a 3 year warranty, all patients receive 3 years of free batteries. This exceptional value is our way of saying thank you for making us your number-one choice in hearing care. After 3 years, or for individuals who did not purchase a hearing aid through Stockton Hearing & Speech Center, we offer our incredible Battery Club! 100 Batteries for just $60! 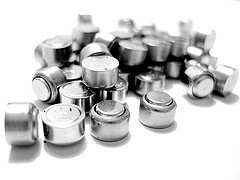 Digital hearing aids require batteries to operate, and the life of a hearing aid’s battery is dependent upon several factors including size, brand, humidity and temperature, and when the battery was manufactured. The battery life is also affected by what type of hearing aid it is used in, the style and brand, the listening environment it is used in, and how many hours of use it gets each day. At Stockton Hearing & Speech Center we understand that you never want to find yourself out of batteries (and you certainly don’t want to spend more time than you have to finding and purchasing batteries for your hearing aid! ), so we’ve created the Stockton Battery Club to make it easy and simple to keep batteries in stock. Members of the Stockton Battery Club can take advantage of our special offer of 100 batteries for $60 — that is enough batteries to last for an entire year! * If any of the batteries purchased from Stockton Hearing & Speech Center do not function properly, we will replace the package at no additional cost to you. *This estimate of 100 batteries per year is based upon a standard 10-hour listening day. *If your hearing aid requires more than 100 batteries in one year, it may need to be serviced, so please contact us today to schedule an appointment to service your hearing aid. Please send me information about joining the Stockton Hearing & Speech Center's Battery Club. *We will never share or sell your information. You will only be contacted regarding details of the battery club.